Nothing brings people together like food. This is especially true in the Middle East and North Africa, where dishes have been passed down for generations. The kitchen is where people can come together, learn, and feel safe to share. SAT-7 TÜRK is inviting viewers from all backgrounds to the channel’s table to learn and share from one another. Food-centric program One Kitchen, One Story embraces the culturally rich flavours from all corners of Turkey. Presenter Karolin Türkmen visits the homes of Turkish women as well as women from other minority groups, including Armenian, Greek, and Syriac. 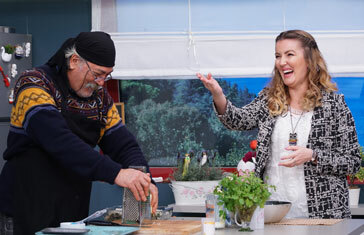 As viewers learn a traditional recipe from each culture, the channel hopes to promote appreciation and tolerance of others. Using food as a communication tool helps viewers understand the similarities between ethnic backgrounds, promoting unity and peace one dish at a time. The cookery medium creates a relaxed and intimate atmosphere in which viewers can hear about what it is like to be a Christian in Turkey. As Karolin cooks alongside her featured guests, the women share their life stories and the challenges they face as Christians. One Kitchen, One Story is geared towards women, but SAT-7 TÜRK hopes it will also attract men who are interested in cooking and culture. Şemsa invites viewers into the studio living room to begin the day with a Scripture. As the heat is turned up in the kitchen, Şemsa invites guests from all walks of life to discuss living a Christ-like life in today’s world. Actors, psychologists, lawyers, writers, and other professionals chat about a host of practical issues, ranging from depression to education for children. What could be better after a delicious meal than a hot cup of coffee? SAT-7 TÜRK has a family-friendly show that reflects Turkey’s culture of talking over tea and coffee during evening prime-time TV. Though the program is geared primarily towards youth named Turning Point’s program set aims to create a friendly and relaxed atmosphere, encouraging viewers of all ages to get involved in the conversation by calling in or writing to the show. The presenters discuss different, relevant youth topics from a Christian perspective live on-air. From day-to-day concerns such as gossiping and lying, the program shows young Christian viewers how to apply their faith daily. 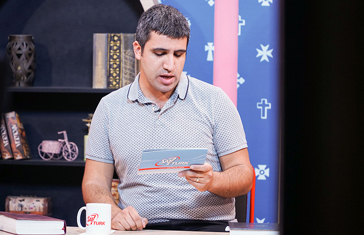 As the first Christian live youth program broadcast in Turkey, Turning Point aims to be relatable to all youth, demonstrating that everyone goes through similar problems. And what could be more relatable and familiar than a cup of coffee with friends?